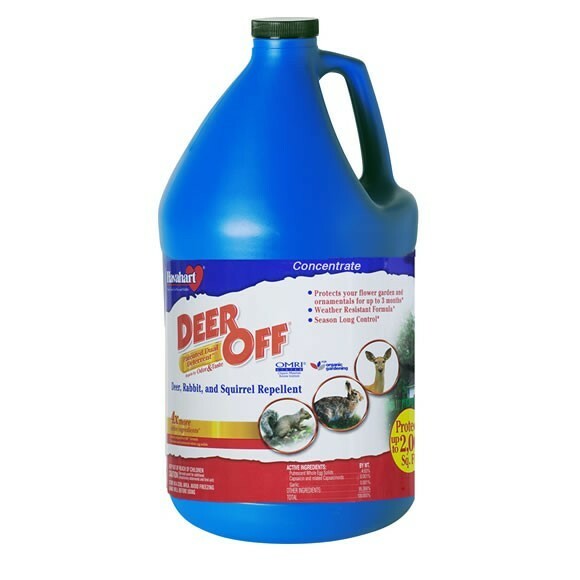 PRODUCT DESCRIPTION: A bad tasting concentrate that must be mixed with water used to repel unwanted deer, rabbits and squirrels. 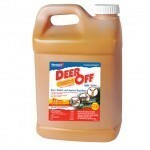 Great for large areas, Deer Off will protect bushes, plants, flowers and other vegetation found throughout the yard. WHERE TO USE IT: Shrubs, flowers, ornamentals and plant bulbs. Patented Dual Deterrent System provides odor and taste barriers to repel deer, rabbits, tree squirrels, and other animals from browsing and feeding upon flowers, grass, bulbs, shrubs, plants, seedlings, and trees. Weather-resistant formula provides effective control. 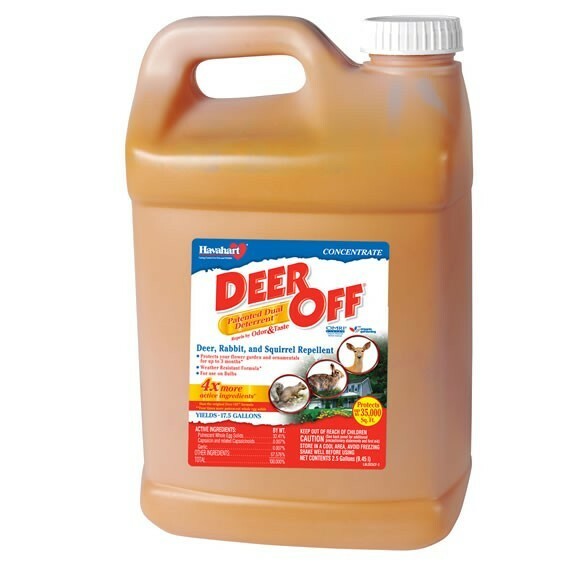 Reapply DEER-OFF Deer Repellent Concentrate every 2 to 3 months or more often during periods when rain occurs. RATE OF APPLICATION: 1 gallon of concentrate will make 8 finished gallons of spray when mixed at the rate of 16 oz per 112 oz of water and cover 1600 sq/ft of shrubs 4 feet tall. When treating grass, you'll get around 3,000 sq/ft of coverage per mixed gallon. 2.5 Gallon Pails will make 20 gallons of spray and cover 32,000 sq/ft of shrubs with an average height of 4 feet or 60,000 sq/ft of flat turf. I have a problem with wild hogs at night. They are digging up the grass in the front of the house. What's the best product to use for this? Please Help. Oh I live in Missouri City TX. Thank You. Generally speaking, hogs which "root" are doing so to expose and then eat the roots of a specific plant. They'll commonly do this to expose vegetables like beets or carrots which grow underground. But when they root grass, it usually means there is a supply of insects like grubs, ants, etc. And when the target is an insect food, there are a few things which should be done to make them stop. The first is to kill the food. This can be done by applying Bifen Granules and spraying over the top with Bifen XTS. It will take 1-2 weeks to kill the insects but in many cases, this will cause the digging to stop within a month. For extra assurance and to get the hogs to move away quicker, apply Deer Off (seen above) 1 week after treating with the Bifen. This will generally repel them and can be used by itself but its mostly for when the animals are targeting the plants and not an insect. So in this case, I'm afraid you'd have to be applying the Deer Off to an increasing area because the hogs will just move to areas you don't spray initially. More importantly, you'd have to renew the application every 1-2 weeks to keep it active. This will prove both time consuming and costly. Conversely, killing the targeted food will yield positive results that last for many months and though you'll need to treat with the Bifen every 1-2 months, it will prove easier and less costly in the long run. Do you have a distributor in Guam (U.S. Territory)? If not, do you ship Bifen. I have many wild pig, and they are rooting up to get to grubs in the jungle-like soil. Every year in rainy season, when clay is softened, they move in and it looks like my yard has been plowed. We don't have a distributor by you but the good news is the best repellent we have, our sound device, is available in both 110 and 220 volt models and we send them all around the world. You can order them in our cart to have them sent directly to you.